Unfortunately, even after PPACA, Americans are still drowning in debt from medical bills. And many of those drowning are people with private health insurance. There’s a massive problem ahead that our political leaders are all dancing around: Medicare. But whenever someone proposes a plan to do something about it (or, in the case of Obama, actually passes a law that affects it), they pay a heavy political price. Why is this such a toxic issue for politicians of all stripes? Why are they walking on eggshells? Because, unlike younger adults, a lot of senior citizens show up and vote on Election Day. Some 61 percent of citizens age 65 and older voted in the November 2010 election, the best turnout of any age group. More than half (54 percent) of those ages 55 to 64 also cast a ballot. People under age 45 are much less likely to vote. Just 37 percent of 25- to 44-year-olds made it to the polls in November 2010. And not even a quarter (21 percent) of the youngest citizens—ages 18 to 24—entered a voting booth in 2010. One thing that often goes overlooked in the discussion of Medicare is its peculiar relationship to Medicaid. Primarily because Medicare does not include room and board coverage for long-term residential care (i.e., nursing homes), elderly and disabled people who need long-term care are forced to spend their resources out of pocket. Many people are forced to sell their homes in order to pay for long-term care. When those resources are exhausted (and they often are), Medicaid kicks in. As of 2008, there were 9 million “dual eligibles” in the United States — people who were on both Medicare and at least some level of Medicaid. 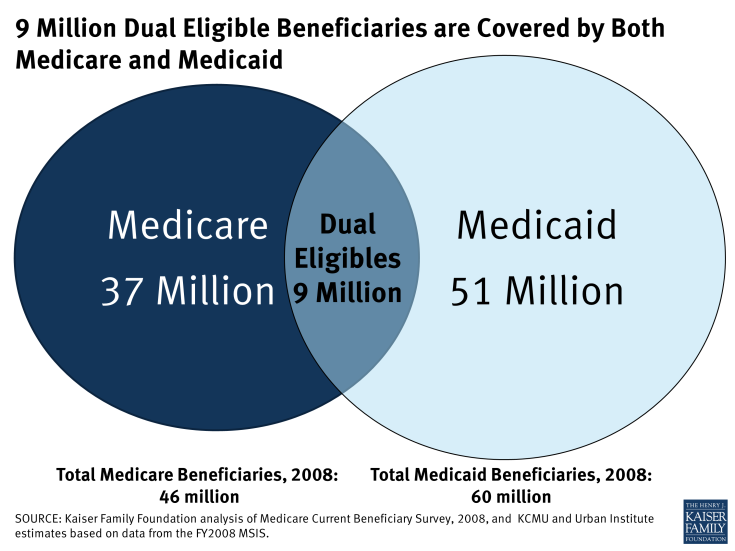 As of 2008, there were 9 million “dual eligibles” receiving both Medicare and Medicaid benefits. For FY2010, Medicaid spending alone averaged $16,460 per dual-eligible beneficiary, and dual eligibles accounted for 36 percent of all Medicaid spending. The Patient Protection and Affordable Care of 2010 (aka Obamacare) did make $716 billion in cuts to Medicare, especially with regard to waste, fraud and abuse as well as overpayments to private insurers that participate in the Medicare Advantage program. Yet PPACA actually enhanced benefits for Medicare beneficiaries (specifically for preventive care and prescription drugs) and extended the solvency of Medicare. As of their most recent report, the trustees for Medicare and Social Security estimate that the Medicare Hospital Insurance (Part A) Trust Fund will remain solvent until 2030. If there has been one consistent message from Republicans for the last several years, it’s that they want to repeal Obamacare. Doing that would actually bring the Medicare Trust Fund to insolvency much faster. Just looking at the far-distant insolvency date of the Medicare Trust Fund could lead to a false sense of security in the meantime. But the fact that there is an insolvency date at all means the program is unsustainable as it is currently designed. 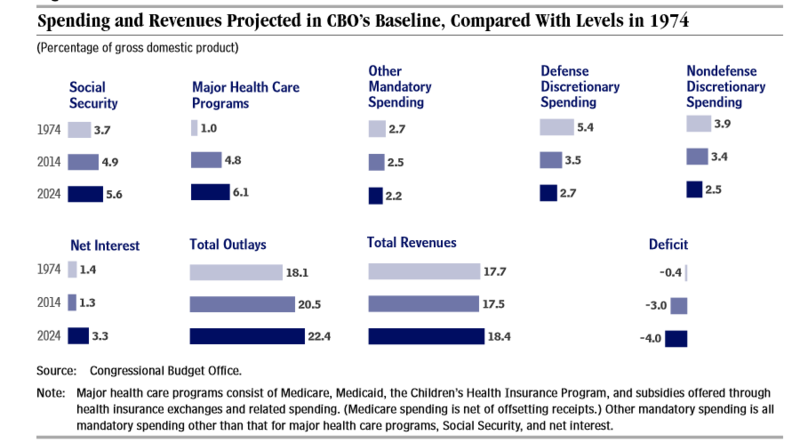 It’s conventional wisdom that Medicare is funded entirely by the Medicare payroll tax and the premiums paid by those opting into Parts B (physician care benefits) and D (prescription drug benefits). 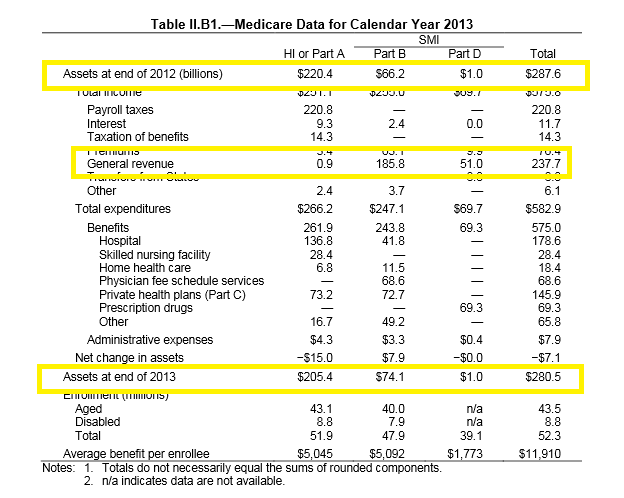 But, in 2013, the Medicare received $237.7 billion in “general revenue,” that is, from the government’s general fund while only taking in $220.8 billion from Medicare payroll taxes. Even with that sizable extra bump, the program still spent $7.1 billion more than it took in. When people talk about the “Medicare Trust Fund,” they are specifically talking about the fund for Part A hospital insurance (HI). Part B and Part D are funded by the Supplemental Medical Insurance Trust Fund (SMI). Just how big a problem is this? In 1974, federal government expenditures on major health care programs accounted for 1 percent of gross domestic product. They have already ballooned to 4.8 percent and are projected to expand further to 6.1 percent by 2024 unless we change something. It’s gargantuan. It’s far bigger and more urgent than the crisis facing Social Security, defense spending or any of our other social programs. In a future post, I will examine just how we got to this point, what solutions have been proposed, and the pros and cons of each.